That Guy George From the Plane (TGGFtP) and I spent the flight from San Francisco to Chicago sitting next to one another, talking first about how hung over he was (he was in San Francisco for a bachelor party and had a collection of air sickness bags in his seat pocket, jokingly at the ready) and then touching into trickier topics, like religion, politics, healthcare, and other topics that Miss Manners suggests keeping to yourself. But honestly, after all the time I’ve spent in planes this past week (BOS -> LHR -> BCN -> SFO -> MDW -> PVD = WTF), I was happy to talk to someone, instead of picking through emails. It’s true, though. Even though I don’t have friendly feelings towards every person with diabetes I’ve ever encountered due to personalities, preferences, and proximity, there still is a strange draw to them. It’s intrinsic. At the MedX conference this past weekend, I was in a conference room with three PWD I knew (Sara, Chris, and myself), but when I heard a Medtronic pump go off somewhere a few rows behind me, I was intrigued and started doing the math. The boop beep boop’er didn’t make their presence known, and I didn’t pry, but if that person came up to me and needed to bum a fresh lancet or a test strip or a fistful of glucose tabs, I would have emptied my pockets for them, no questions asked. There’s a level of understanding in play that’s automatic, and feels downright autonomic. George was right: I like having people to be weird together with. 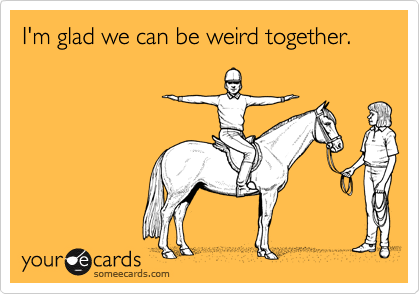 And I like the fact that being weird together makes us closer. Boop Beep Boop! Boop Beep Boop. Unraveling the UnConference. Looking Back: PWD in the Wild. Sometimes people are brought into our lives for us to share a moment and strengthen each other that we are not alone. No person is an island and time together can facilitate the ability to grow for both of us. As always have a great day and thanks for your views. Boop, beep, booper!!! lol Thats a way to put it!!!! Yes it is nice to relate to weird, funny people such as you!!! You’re first learning this now? Oh right — the DOC is a youngster compared to SFF fandom, and many of us don’t remember the days of the huge computer user groups, or the heyday of hobbyist computer shows. The “BOF” (Birds of a Feather) phenomenon has been around for decades, and it often takes another flock member to argue intelligently about why Kirk might be a better character than Spock, PCs might be better than Macs, or why the decorated undersleeves in Titians “Sacred and Profane Love” and Bassano’s “Road to Calvary” might not accurately reflect contemporary attire. Though it’s arguably more personal when one argues for Minimed over Animas, Freestyle Lite over Bayer Contour USB, or low-carb over whole-food… and has spreadsheets of personal lab reports to back up one’s assertions. Here’s to being weird! Great post, Kerri. Weird is a compliment – that’s how i see it. Weird-o makes the world interesting. It’s the people who claim to be “normal” that you have to watch out for. weird by proxy… Mom and sister of T1s.